...yet this whole blog complains about Peyton's poor performance resulting from a bad O-line. I was aware of the irony, however there is a difference between Manning and Brady in their responses to pressure. Perhaps I'll write an article on it. Well if you don't write an article I am still curious to hear the difference between the two, perhaps in the comments. Given this is a Colts blog I assume you will write an article about how Peyton is better than Brady while under pressure. I just don't understand how you will actually argue it given their respective post season records. You confuse your terms Mr. Derp. Pressure as in pash rush? Pressure as in the importance of a particular game? Pressure in terms of the level of responsibility on the offense? When I write something I am being VERY specific. Make sure that you are clear in your own head - you may find that you don't actually disagree with the *specific* point I am making. Look at Manning's and Brady's post season stats. Manning has better numbers. Football is a team game, and the Patriots have had the best TEAM two times more than the Colts. I knew what you meant when you wrote pressure, I just doubled down on it. In 2001 Brady was sacked 41 times in the regular season. He went on to win 2 playoff games and a Super Bowl. Who is good under pressure in the playoffs, when pressured by the D line repeatedly? Brady averages 1.7 sacks per game (243 sacks in 143 games) over his career in the regular season. Manning averages 1.12 (230 sacks in 206 games). Brady gets hit way more yet wins more playoff games and championships. Brady and Manning both have 18 playoff games under their belt. Brady has 1 less interception. Again, who is able to lead their team to 14-4 in the playoffs and who is 9-9? In summary, Brady gets hit and hurried much more than Manning, yet throws similar (or less) interceptions and wins way more playoff games. So who really is better under pressure? As I said before, I am curious how you put Peyton ahead of Brady. I'm not a stats guy. I only look them up to verify what I already know to be true. The only reason Manning gets sacked less than Brady is because he gets rid of the ball. I have seen Brady play games where he was pressured three times - two resulted in sacks because he reacted VERY poorly and did not anticipate. I have watched multiple games THIS year where Manning has been hit 15 times and not been sacked once. EVERY game this year Manning has faced more pressure than Brady saw in the Super Bowl game he choked away. Every game this year. It was a big deal that Brady was hit that much - only because it never happens. You saw what happened to the vaunted Pats offense that set all those records; unraveled. Just use your eyes man. Seriously. Most games Brady could be back there in a rocking chair doing his taxes. All so he can throw a 15 yard in route. Wow! Mr. Derp really laid the wood on this one! With heavy statistical evidence like sacks per game and playoff wins, I wonder why this was ever debated! Do yourself a favor, Mr. Derp and dig a little deeper than just ESPN's NFL stats page. Then, think about what you are going to write and ask yourself, "Does this seem just a little too simple to determine which of these $100mil/yr QBs is better?" And if it does, then just save the server space. Still haven't heard why Peyton is better than Brady under pressure. I have put forth several reasons why Brady is better, but all that comes back from Anonymous is an ad hominem attack. No, playoff wins aren't the only way to determine the best QB, but it sure does take into account all crazy events on every play in a season. Very comprehensive in my opinion. Manning has not seen as much pressure in 2010 as Brady did in 2007 Super Bowl. Brady was sacked 5 times and the Pats O-line sucked for 4 quarters. Every game? Come on. Maybe a couple, but not every. Manning has not been sacked 5 times this year. It is ridiculous to say that Brady never gets hit that much. Look at the sack totals. The numbers clear as day show Brady gets hit more throughout his career than Peyton. Brady has never had a season with less sacks than Manning (except when he was injured for the whole season). Manning has been virtually untouched in his career when compared to any other quarterback. Yes, he does get rid of the ball. Not sure if the end result of those throws is a better outcome, though. Maybe Manning throwing the ball a little early isn't helping his team. Is your whole argument that Manning is better under pressure than Brady because he gets rid of the ball earlier and therefore gets sacked less? Mr. Derp, I just said that stats are not useful for this discussion - yet you come back with more stats? There is a insider term in the NFL called a "Dirty Pocket". There is no stat for it (sorry). And posting playoff records really does not mean anything, does it. The logic that says Manning is responsible for the 9 playoff losses is like my saying that it is Brady's fault you guys lost to Cleveland a few weeks ago. Stats do reflect what happens on the field, but it is a incomplete and distorted reflection like a funhouse mirror. Anyone who uses them to describe on field action is going to have a distorted and incomplete view of the game. If you still think you are "right" on this, please don't reply. This is becoming tiresome. 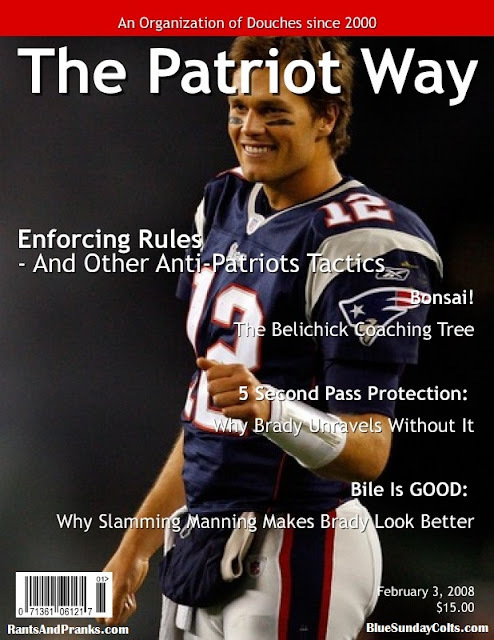 I think you should write an article about how Brady vs Manning is mostly a media creation.